“Dear Mr. Vernon, we accept the fact that we had to sacrifice a whole Saturday in detention for whatever it was we did wrong. But we think you’re crazy to make (us write) an essay telling you who we think we are. So ends the great movie which recently celebrated 30 years since its release. This John Hughes movie starred: Molly Ringwald, Judd Nelson, Emilio Estevez, Ally Sheedy, and Anthony Michael Hall. I was in high school at the time this movie was released. It is one of my favorites. I watched it again this weekend when it was on television. Now that I am an adult, I saw it a little bit differently but still appreciated it and loved seeing a glimpse again at high school. Let’s face it, a lot about high school is great but there are also things that are awful. People are in cliques, don’t normally seek out friends who aren’t in their group, and can be truly mean and condescending to others, as demonstrated in this movie. One line that stuck out to me this weekend was Brian telling Claire, “God, you are so conceited Claire.” She then answers, “I’m not saying it to be conceited.” They then compare the fact that they are both under lots of pressure — peer pressure, pressure of grades, and other pressures. The fact of the matter is that all of us have tough things to deal with, have pressures, and have good things as well. And, as these five students found, we are more alike than we are different. And, we are more than the labels we give to one another. 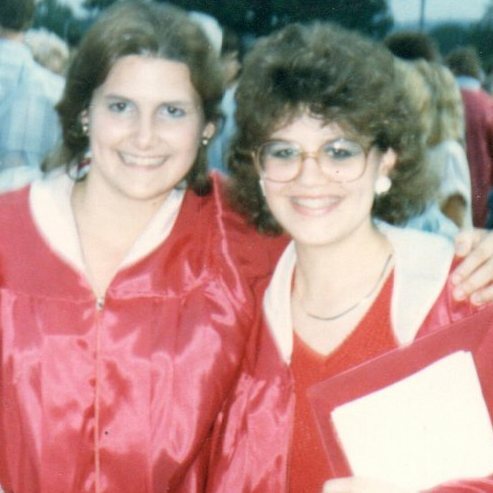 Here I am with one of my best friends Jennifer at our high school graduation. How do you like my glasses? So 80s! Jen is still one of my closest and dearest friends and I am truly thankful for knowing her as long as I have. I had a fun experience in high school and had quite a few friends. I was active in church youth group, the drama club, showchoir, and chorus, and did a column for our town’s paper on teen activities. So, I suppose I could be called a Theater geek. I was shy, and sometimes was made fun of and teased. I was by no means in the popular crowd, but that’s okay. I knew some great people and am still in touch with many of them today. And, I am happy to say, I am now friends with people who I didn’t hang out with very much in high school. That has been a great blessing. I have served on the planning committee for two of my class reunions and plan to for a third one next summer. We have classmates who want to come back for these reunions and truly enjoy doing so. We have a great turnout and so much fun. That is a blessing to me. It is truly awesome that people who may not have been close during high school are now friends and regularly keep in touch via Facebook, texts, phone calls, and visits. I know that is rare so I don’t take it for granted. For those of who are currently in high school, I hope and pray that you have a fun experience. Please remember that you are special exactly as you are, you are worth a lot, and that teasing and bullying from others doesn’t need to define you or change who you are. It’s okay to be different and uniquely you. At the time, it may not seem that way, but speaking from someone who has been through it, life does get better. When you grow up, you may even be friends with people who you never expected. And, as this movie teaches, we all have much more in common than you may realize. We aren’t our labels. I hope and pray that you can remember that. And, if you are struggling, please talk to a friend or adult. There are people to listen and those who care about you. To my classmates, I am so very thankful for you and the friendships that we have. I look forward to seeing you next year at the reunion! The class ahead of me is having their reunion this fall. That should also be fun. Hi and Happy Thursday. I came across this photo of myself a while back. It thought it would be fun to share today. It cracks me up since I seem to be trying to read the music and touching the keys. I must have watched my aunt and some other people to know what to do. 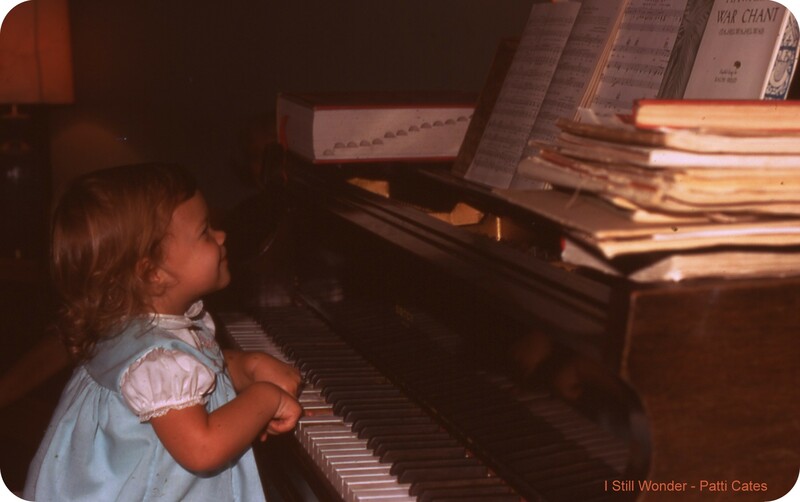 I have always loved music and apparently at this age, loved trying to play some music. Who knew how it sounded? I love the smile on my face and how happy I seem to be. Music has always provided so many emotions and meant so much to me. This was the piano at my grandparents’ beach house. It was well-loved and used a lot over the years. We regularly had sing-alongs there and my aunt would always play the piano for us. She often played with no sheet music and has always amazed me with that ability. I have enjoyed playing for years but always got in trouble with my piano teacher for not practicing enough. She was also our organist at church for many years so I saw her several times a week. You would think that the constant reminding would have made me more willing to practice, but no. It was, in fact, a constant struggle. Several years ago, Kirk and I bought an electronic piano with many settings and options. It is fabulous. I still love to play and still need to practice more. I have a few books of music that I am working on. They include favorite hymns, show tunes, and Christmas music. It is fun and something I still need to do more of. I want Ian to learn to play the piano too. He has a good ear for music and enjoys touching the keys of our piano. When he tries, it actually doesn’t sound too bad. I have a guide to help with the name of each key. He, like me, will need to practice, practice, practice. For now, it is still just a fun activity. I wonder what song I will be able to learn and how long it will take me? Hopefully not too long, if I will make the time to practice!! Every once in a while I stop and realize how old I am and it is a shock since I still feel like I am in my 20s at times. But I am actually in my late 40s. Gulp. Where did that time go? It seems to have flown by and yet, I have enjoyed each and every one of my years and have made the most of them. I feel truly blessed. This coming Sunday is the 25th anniversary of a church that I went to at the beginning — in 1990. That was 25 years ago? What the? Gulp. I do feel old. 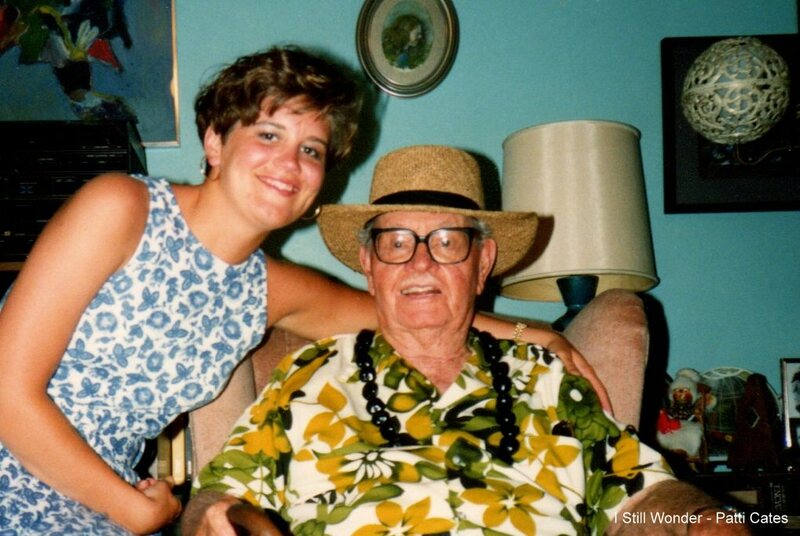 This photo is from the summer of 1990 with my dear Grandpa. It is a treasure and a favorite of mine. 1990 was the year that I graduated from college and started my first professional job as a journalist at a small paper. So this fall will be my 25th college reunion and I am looking forward to that very much. I went to the 20th reunion that was five years ago. What the? Already 5 years has passed? Wow. I loved that first job so much even though I didn’t make very much money. It was a great learning experience and a great beat. I met some fascinating people, covered a murder trial, interviewed a new slate of commissioners, and watched as the county built a new jail. This was the time that I met my friend and paramedic Gordon D. who gave me priceless advice of never being a grave hugger. I will always remember him and our chats at the ambulance service. I heard some the dirtiest and funniest jokes in my entire life from him and his co-workers. And learned how important it is to make the most of each and every moment that we are given. That was also the year that I got to know a judge quite well. He explained things to me about several cases that he was presiding over. He was an amazing mentor and teacher and someone who I am honored to have known. He has since retired but served our county very well. The staff of the newspaper was also amazing. I am back in touch with several of them and it is so very special. They were part of the start of my professional life and to be in touch again means more than I can say. In my 20s, my career got going and I loved each new experience and all of the articles that I wrote. I then switched over to technical writing. In my 30s, I got married and started an amazing journey with Kirk. We have traveled to great places and have had a blast. And, my career grew and I finally landed my dream job. Bliss. Then two months after Ian was born, I turned 40 years old. My life totally changed again. My career was put on hold for Ian and I have never regretted that. Now that he is in school, I am happy to be able to work at home, have time to write, and serve at his school and in activities with him. I truly feel that I have the best of both worlds. Each decade has brought me amazing blessings. I keep learning more and more and my heart grows larger each and every year. There has been painful loss over the years and also amazing blessings and new gifts. But throughout it all, I have grown and learned and am thrilled for the journey. Next summer will be my 30th high school reunion. I hope to serve on the planning committee again with a great group of gals. I love my class and love that we enjoy seeing each other and spending time together. Again, I can’t believe it’s almost three decades since high school. Gulp. It is amazing that the 50 year mark is right around the corner. That still is shocking and I imagine will be tough. But, my life has been a great one so I will celebrate and be thankful for each and every one of my years. I wonder if I will continue to appreciate each moment and make the most of it? I plan to do exactly that. After all, we have a young child who I am loving watch grow up. There is much to still live for! Happy Birthday today to my niece Gussie. She is 15 years old. I remember when she was a baby. She has grown into such a lovely young woman! It is amazing to see! Happy late birthday to her cousin Justin, who turned 14 years old on Sunday. He is a wonderful young man. We love them both very much. Ian wishes you both a very Happy Birthday! Hi and Happy Thursday! Can you believe it has been 50 years since “The Sound of Music” was released? Amazing! Here is a Throwback Thursday photo of me with my mother from our community theater’s production of “The Sound of Music” play. A few songs are different than the movie but the overall story is the same. 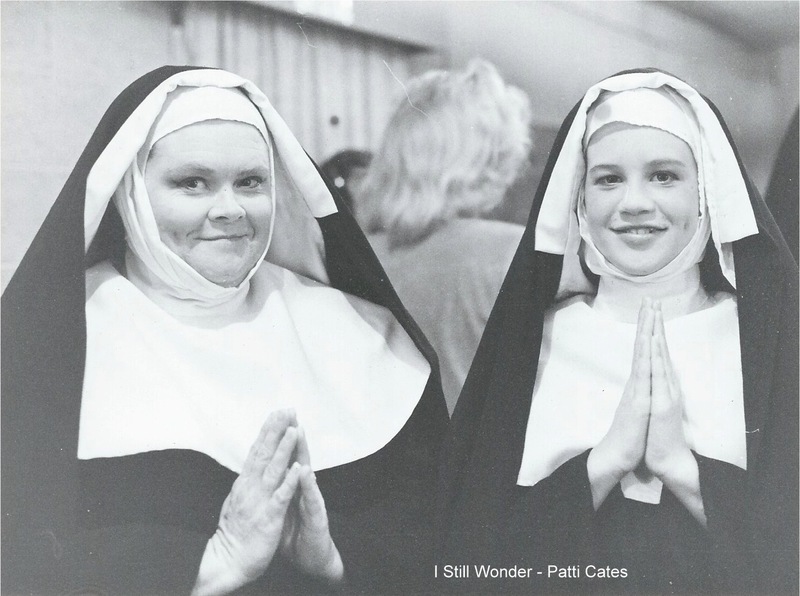 In this production, Mom and I were nuns and in the chorus. My sister played Marta and did a great job. It was fun to perform all of the songs that we grew up listening to in the movie. Yesterday, I tried to think of how many times I have seen this amazing movie. I can’t count that many. I remember seeing it once at a movie theater and that was fantastic. Most of the time, however, we watched it on television. I never liked that as much since they cut some of my favorite scenes out. Then one year, I got the DVD for Christmas. I think this was an anniversary special so it has lots of tidbits and news about the cast and the making of the movie. It was great to have my own copy so I could sing each and every song while watching it. I do love to do that. How about you? Last night, ABC’s 20/20 had a great behind the scenes special. Diane Sawyer interviewed Julie Andrews. In addition, they traveled to Austria together and visited the various places the movie was filmed. It was fun to see her and Christopher Plummer and hear some of the stories about filming this classic movie. I just wish they had talked more about the kids who are now all grown up. It was also a treat to see the real Maria Von Trapp singing with Julie Andrews. That was truly special and they sounded great together. I think they were singing “Edelweiss.” I hadn’t realized that she was actually in a scene of the movie. Or that Christopher Plummer is a classically trained pianist. As a child, I simply loved the story and all of the music. And the children seemed to be having such fun with this cool young woman. Now, I appreciate what the message of the movie was to me – of being confident and following your dreams and finding what makes you happy. These are very important lessons in life to remember. Also, that there is real and true love. And let’s not forget that the right curtains can make some great play clothes. I truly love all of the songs from this movie and love to sing them — “My Favorite Things,” “So Long, Farewell,” “Do Re Me,” “Climb Every Mountain,” “I Am Sixteen,” “Edelweiss,” and the list goes on. At the Academy Awards, Lady Gaga did a gorgeous medley and blew me away. Her voice was amazing and Julie Andrews herself seemed to enjoy it. WOW! Happy Anniversary to all those involved in this my favorite musical! It is the day to enjoy corned beef and cabbage or Irish Stew. It is the day to have a green beer and have a party with friends and family. It is a day for celebration and fun. 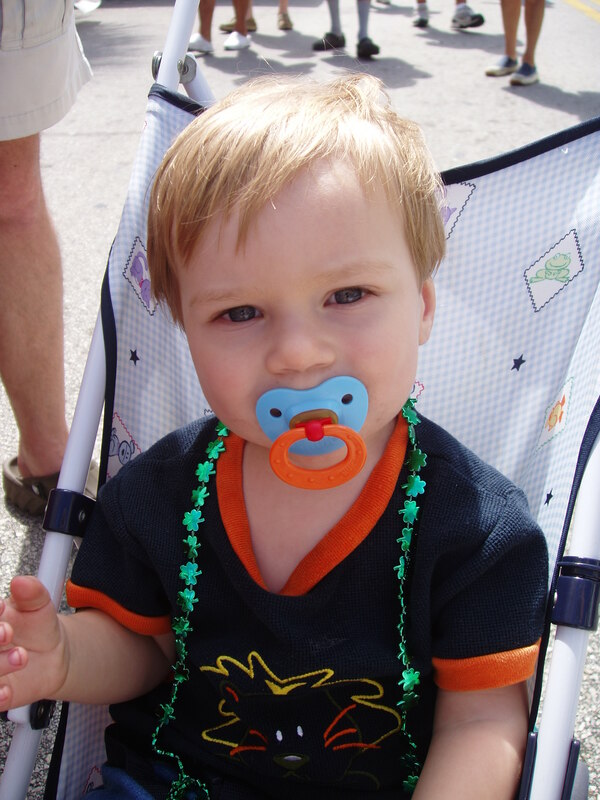 This photo is of Ian from a St. Patrick’s Day parade that we went to in 2009. He enjoyed the festivities and all of the green. The past four weeks have been busy, busy. I can’t believe how long it has been since I have written. Have you missed me? I have missed you! First, we had two weeks of sleet, freezing rain, snow, and very cold weather. In two weeks, there were only 2 days of school. At first the snow days were fun, but then things got old and tedious and there were a few issues to deal with. Then the rains came and didn’t seem to let up for a few days. Rain and all of the melting snow caused some flooding. Then we had lots of water and mud around the yard. Mud and muck and messy shoes. Then after all of that, we had a few days of school but then ended up getting sick. Between the three of us, we have had fevers, ear infections, and bronchitis. Because of that, we missed Ian’s Cub Scout banquet and parties. That was a bummer, but nothing could be done about it. Now, we are FINALLY feeling better and life is getting back to normal. It’s not been easy but there finally is light at the end of the tunnel. YEAH! Life if never dull, is it? I just hope that things start settling down for us again. My plan is to write again more regularly this week. Just hope that will be what actually happens! Until then, take care. Hi and Happy Thursday! For today’s Throwback Thursday, I wanted to post a photo of Ian reading a book. Well, at the age he is in this picture, he was looking at it or doing pre-reading. He has always loved books and still does. His 1st grade class at school is working on 20 hours of reading in honor of Dr. Seuss’s birthday. Each hour that Ian reads means he can color in The Cat in The Hat’s Hat on a piece of paper. So, we are on our way! I remember when he was first learning to read that he was nervous that he’d never get it. He worked hard and consistently and now LOVES reading. In fact, his favorite place to go is our city’s public library. How great is that? 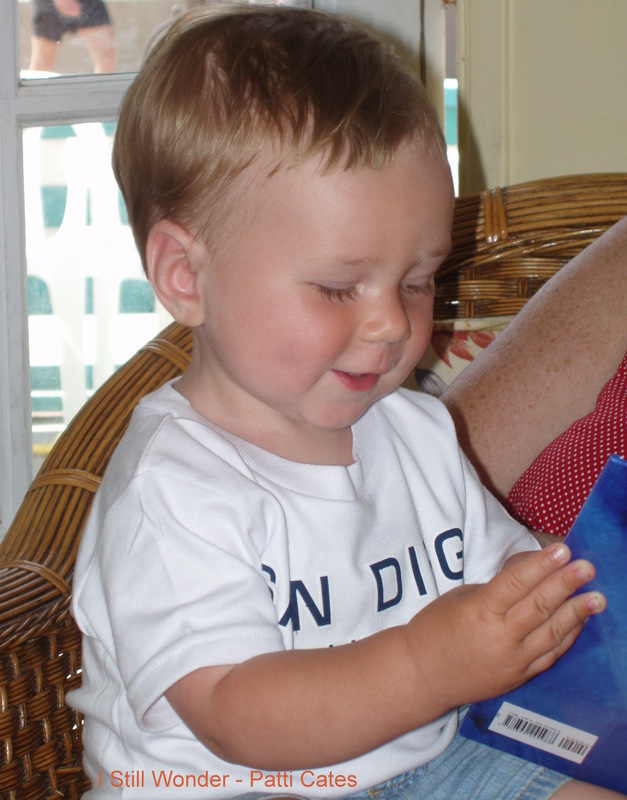 We read to him when he was a baby, toddler, preschooler, and then he learned to read. We still read to him but enjoy the fact that he can read to us. One of my favorite things to do is sit with him and listen to him read a book. I am so very thankful that he enjoys reading as much as I do. Books have always been part of his life and our home. My prayer is that all children can learn to read and learn to love it. I also hope that all adults can read as well. Literacy is so very important! I wonder what he will next be reading? I cannot wait to find out!!! Hi and Happy Wednesday! 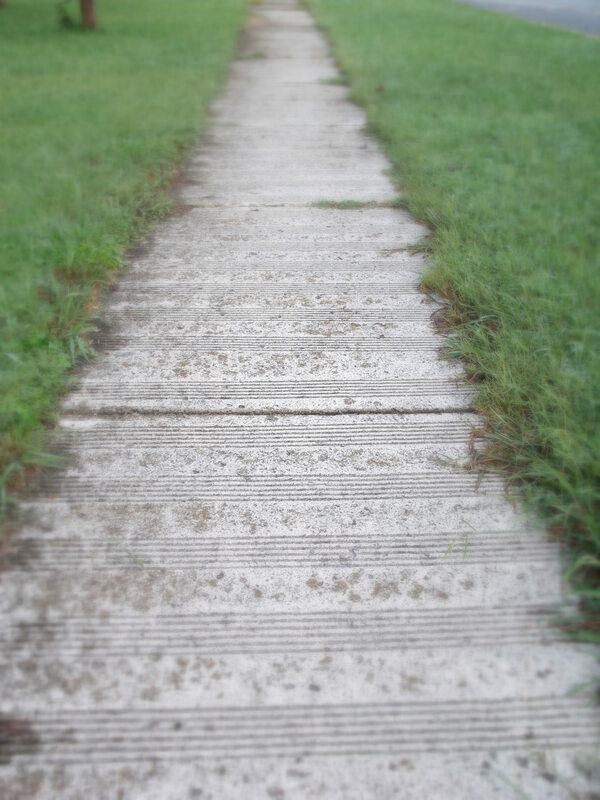 I recently joined a poetry prompt via the Word Press site. They give styles and subjects to write about. One day our writing was to be on Water as the subject. I didn’t write it then but decided to today. 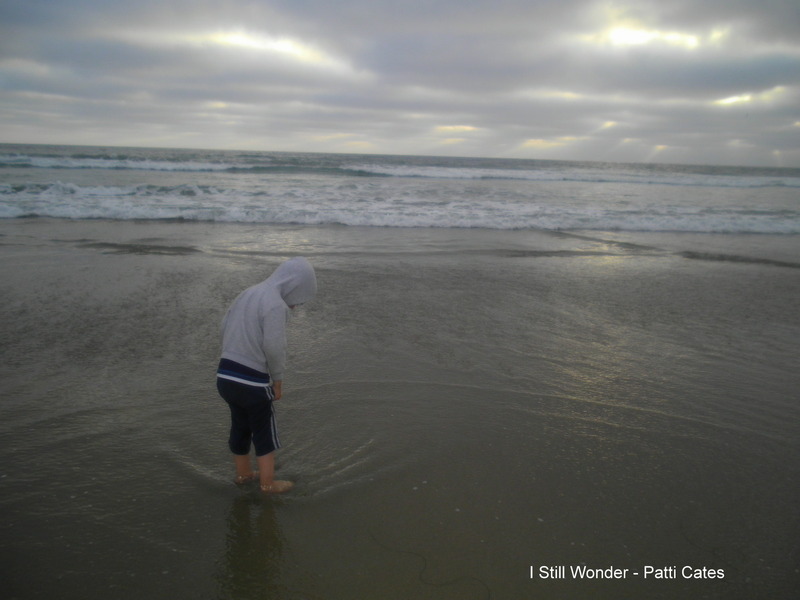 Here are some thoughts on water and a poem as well. One of my favorite writers who was quite good at rhyming was Dr. Seuss. I love that Ian likes him as much as I do. Very cool! We are celebrating him this month at school. Water is something that I love and cannot live without. I drink a lot of it each day with ice. Cold water keeps me going and is satisfying. I love having running water that I can drink in my house. I truly feel spoiled to be able to do that. Also the water that becomes hot for dishes, showers, laundry, and baths is wonderful. This too is an amazing gift and very special to have. I have learned not to take it for granted and feel quite blessed to have it. I also love salt water — in the sea and ocean, tears, and sweat. These are three powerful types of salt water. I love the ocean and its beauty. I feel calmed when at the beach and love it. I love to watch the ebb and flow of the waves. Sweat is great since it shows up when you are working hard at exercise and working on staying fit. It feels good to break a sweat and I am trying to do more of those. Tears for me sometimes flow very easily — both from happiness and sadness. Sometimes a quick cry can help things get better. This past week we also saw the destruction of water and problems when it goes where it shouldn’t. Thankfully there wasn’t that much of that! Not my best poem but a try nonetheless. What are your thoughts on water?